Captain Marvel is a relaunch of a 45 year old character (in reality, not in continuity) known as Ms Marvel, or Carol Danvers. 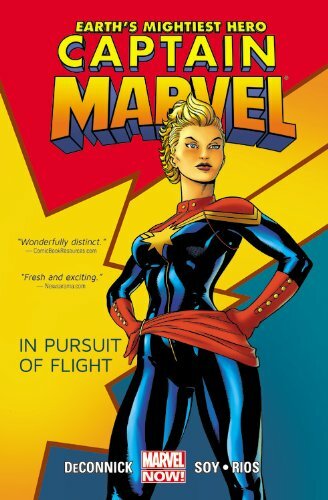 Carol is an air force pilot who was caught in an alien explosion, granting her superhuman powers – flight, super strength, invulnerability, and energy beams that she can shoot from her hands. She’s a powerhouse, probably on a par with Superman. 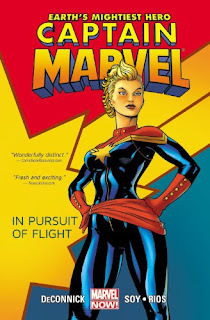 This relaunch updated her costume from a swimsuit-and-sash style to a full body uniform that has in more in common with the early 2000’s X-Men films, and it changed her name to Captain Marvel, more in fitting with her military background. In this story she meets with an old friend and is catapulted back through time to the 1940s, to meet a group of Women Airforce Service Pilots fighting on a Japanese occupied island. On her journey back to the present day she is bumped through various different years, meets her childhood heroes, and gets to fly planes with some of the most talented women of the 20th century. In honour of the new Superman movie - Man of Steel - Comixology are once again doing one of their legendary sales, so once again we'll give you a guide to what's available. The sale is on until 11pm, Thursday 20th June and most titles are just 99 cents each - that's about 60p in UK money. It's an incredibly comprehensive sale, covering the important, and best, Superman stories of the last 80 years. More information after the cut. Our post on DC's continuity has now been updated to include Flashpoint and the launch of the new 52 series of books. Go check it out here. We aim to produce a post explaining Marvel's major events soon as well, although explaining their continuity may be harder as they have never reset their universe like DC has. The X-Men are a team of mutants. That is, their genetics give them superpowers - anything from a healing factor, to telekinesis, to angel wings, to the ability to phase through solid objects. Professor Charles Xavier, a phenomenal telepath, is the head of the X-Men. As a team they fight terrible threats from this earth and beyond, and struggle to gain acceptance from regular humans who sadly are taught to hate and fear them. Jean Grey is also a telepath. She's incredibly powerful but too young to fully handle this power, so has blocks placed on her abilities (by Xavier) to ensure she doesn't harm herself or others. 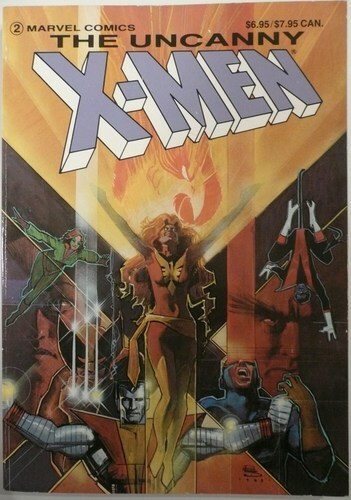 The Dark Phoenix saga is the story of how these blocks are lifted, how she gains power beyond measure and threatens the entire universe, and how the X-Men (and others) save the world.